I'm bringing back Midweek Munchies! 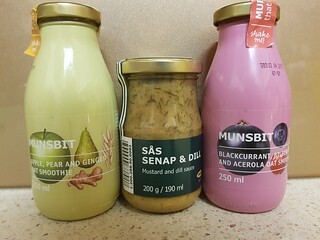 Not in any official capacity (as it once was on Jennifer's blog, but just to share with you some random things I have been eating that don't really fit anywhere else. These might include products I've tried, things I've bought or been sent, odds and ends I've eaten out or at friends, or things I have made at home that aren't from a cookbook. I've had so many of these photos building up, so time to share! 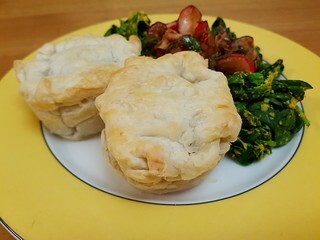 I made these Easy Jackfruit Pies from the Like A Vegan blog to use up a tin of Nature's Charm jackfruit that I'd gotten in a mystery box. The recipe makes 6 pies, using four tins of jackfruit. I only had one, so I made a third of the recipe to get two pies but also added some mushrooms to the filling. 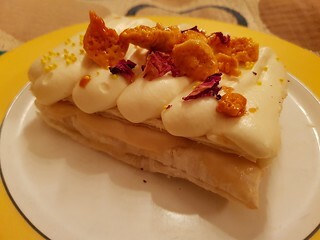 Really easy to make, using puff pastry. 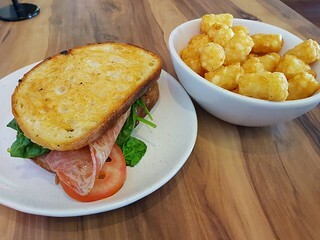 Last year everyone was talking about this Wendigo sandwich. Bacon, peanut butter, dill pickle, and mayo. 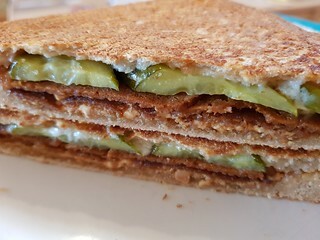 I veganised it with some Vegie Delights bacon (they finally reformulated the whole Vegie Delights range to be vegan, the bacon used to be vegetarian... turns out I am not really a fan of it) and Vegenaise. And I toasted it. It was fun and very tasty. 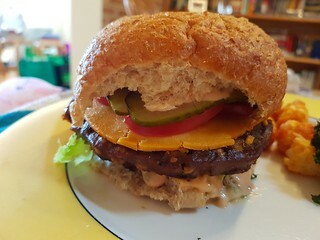 After trying the Beyond Burger (too meaty for me! ), I tried the Beast Burger. I know people love these, but I really didn't like it at all. It was so weird. The texture, the taste... something about it seemed kind of chalky and artificial. 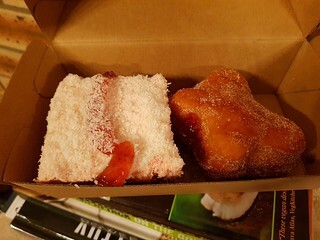 Glad there were only two patties in a box and there were two of us so I didn't have any left over, I wouldn't want to eat these again. I have a bunch of the FYH Vegan Egg, though I don't really like it as scramble. Tofu scramble for ever! But I did have fun making an omelette with it. 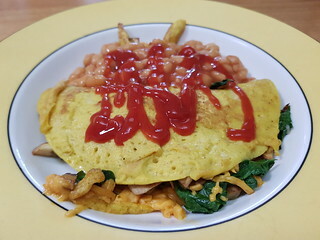 Filled with spinach, Daiya cheddar, and mushrooms and served with some baked beans on the side. Plus ketchup. Every year in August in Brisbane there is the 'Ekka', an agricultural show in the city. I haven't been for years. So many people, plus it is all about animal use. There are some cool fruit and vegetable displays, but I'll just look at photos thank you. It used to be a vegan wasteland for food, but several food stalls apparently have vegan options last year. One of the famous Ekka treats, that is never vegan there, is Strawberries and Cream - Strawberry ice cream in a cone with fresh strawberries and cream. You know I love strawberries. 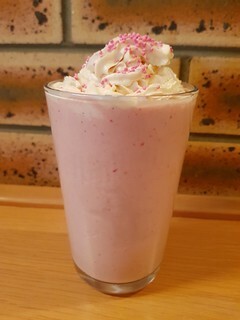 So last year I made a strawberries and cream milk shake. 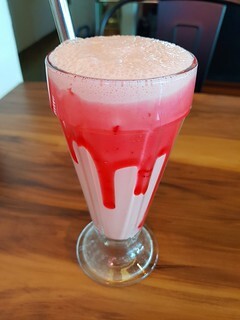 It has strawberry soy milk, So Delicious strawberry ice cream, strawberry jam, and frozen strawberries in it. Topped with some soy whipped cream and pink sprinkles. Ikea is fun for vegan food. 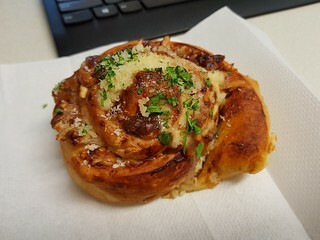 While our Ikea doesn't have the vegan hotdogs or ice cream in their cafeteria yet, there are many good finds in the food hall. I tried the veggie balls a while ago, but not the biggest fan so I don't buy them regularly. These are a few things I picked up one visit. The oat smoothies were fun, not quite as creamy as I expected with the oat in them. But the real star is the Dill & Mustard sauce that is so good I could eat it off a spoon! Have you been eating anything fun lately? Missing my sweet Gizmo face. The Meatless Ball Sub is truly delicious, one of the yummiest things I have ever eaten! I can't wait to finish working my way through the menu so I can come back to this multiple times. Cashew brie, tomato relish, veggie balls, and cashew parmesan in a sub make for an amazing combination. And it is big and filling! Also sloppy, I had to knife and fork for this, but so delicious. One time I went there to order off the menu, but I got side tracked by their lasagne special. I have only seen this there once or twice. But I definitely recommend it if you see it. 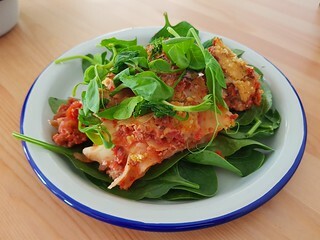 TVP mince, cashew brie, tomato sauce, rice paper bacon... it is a great meaty and cheese lasagne. Flora also has salads! You can get a big salad plate, or you can get them as a side. 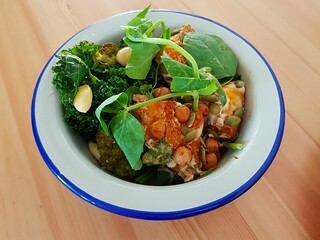 This is the Roasted Pumpkin and Chickpea salad, and the Broccoli, Kale, and Almond salad. 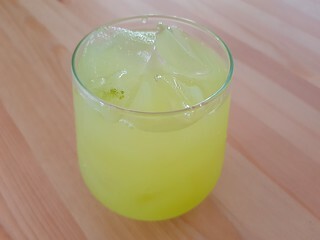 Let's talk drinks. While I am a huge fan of their iced turmeric and iced cacao, they also have some juices. 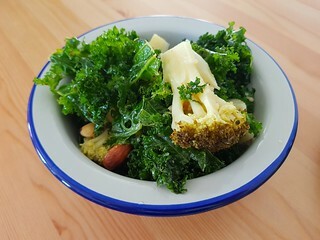 I tried the Daily Greens, which was good (what were the daily greens? 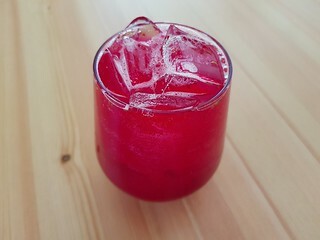 no idea), and the Beetroot, Apple, Lemon, Mint, Ginger, and Chia juice. This was my favourite, though I could have done without the weird floating chia. I've been there so many more times, so watch this blog for more! 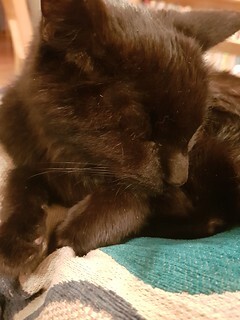 Another one of the kittens, all grown up. 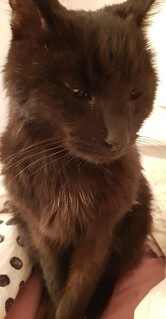 This is Cedric! My brother visited recently. He lives in the UK, and this was his first visit home in two years. He also brought his partner, who we had never met. It was super exciting, and she is super lovely. She is also Spanish. So one night the two of them cooked up a vegan Spanish feast for the family. Even though I am the only vegan, which was super sweet. They also made everything super mild for my sensitive self. Double lovely! 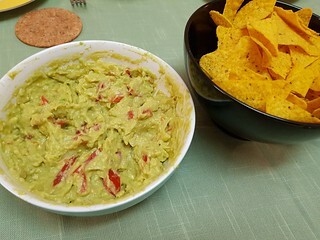 A big bowl of guacamole went down a treat. Followed by sweet little bowls of gazpacho. 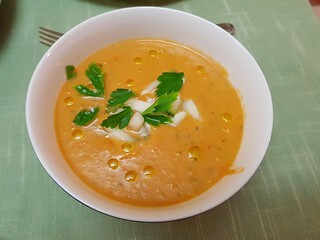 It is summer here, so chilled soup is a good thing! 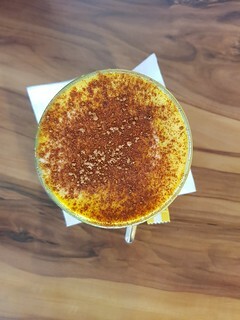 (This was the one thing that had a little bit of capsicum in it, so I was glad for the small serve). 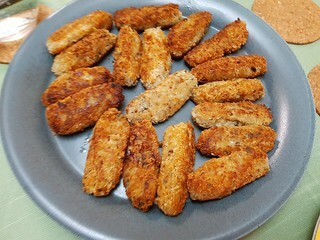 Creamy Mushroom Croquettes were delicious. 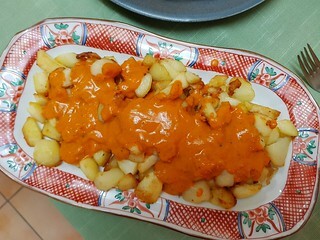 Plus a delicious platter of Patatas Bravas. These potatoes were cooked for ages, and they were so crispy on the outside and soft on the inside. Plus the tomato sauce went so well. Plus a big bowl of Spinach and Chickpeas. It was a fantastic spread! It was a lovely dinner. Afterwards we stayed up watching The Emperor's New Groove, which is them best Disney movie. It was so great having them visit, and I look forward to them coming again! Remember all those tiny kittens I shared with you over the last several posts? Well, they are all grown up now! 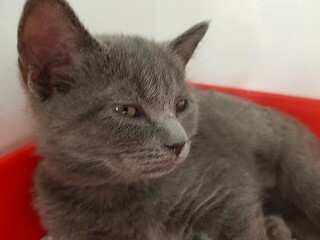 They have been desexed, and are ready for adoption! 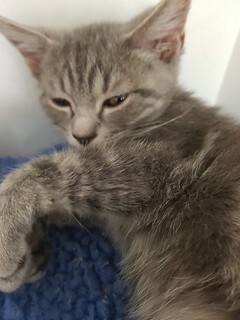 This little girl is now called Luna, and already has a home to go to. 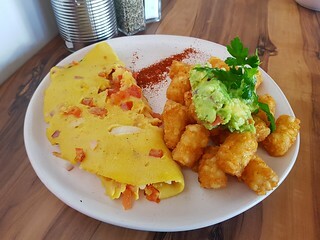 I'd known about French crepe cafe Tamm Ha Tamm for a while, though it didn't pop up too frequently on the vegan web so I forgot about it. Not a vegan place, but I had heard it had some vegan options. But I had to go and pick up some medication I get compounded for Dim Sim from a pharmacy that happened to be right next to it, so it seemed like a good chance to try it out. The menu they gave me varied a bit from the one online. For a start, the menu I saw had three vegan options for the savoury crepes. I picked out The Broceliande, which had garlic vegetal butter, sauteed mushrooms, fresh spinach, and balsamic fig glaze. 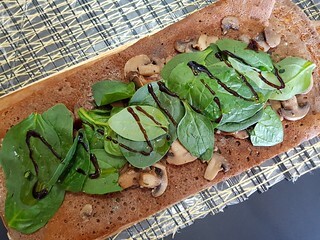 A lot of the sweet crepe options can be made vegan, though instead of the regular crepes they use the same buckwheat crepe for the vegan ones that they use for the savoury crepes. 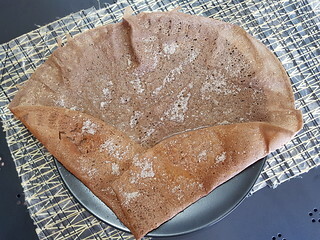 So they are a bit sturdier than what you think of as crepes, but still good. 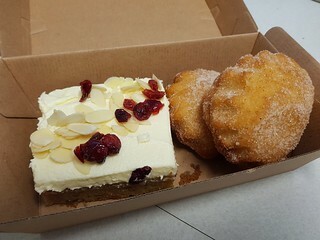 I went for the classic, lemon and sugar, though they also have fruity options and a vegan chocolate sauce. 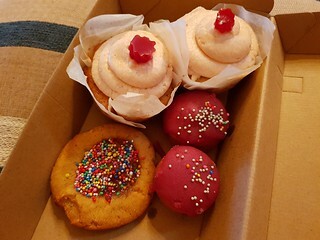 They also make some baked vegan goods - they called them cupcakes, but they are really muffins. 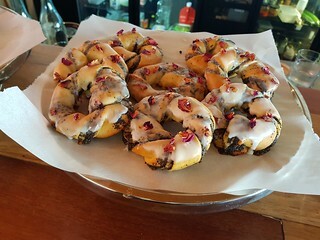 They use different flours in each of them, and the flavours come from essential oils. 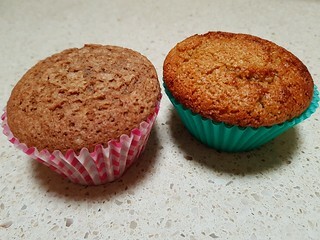 One was an orange muffin made with green lentil flour, which was a bit heavy and the essential oil had a definite flavour to it that made me think of aromatherapy. I'd prefer regular orange essence. And regular flour! 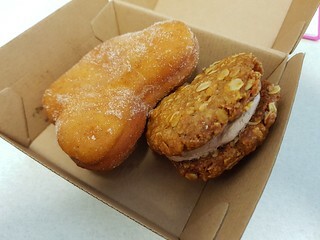 The other was a Cinnamon muffin with buckwheat flour, which was my favourite. All those kittens had one great mumma. This is her! The two gingers were hers, and the took on the six greys as well. 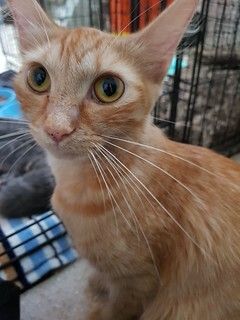 Her name is Pippi, and she is now up for adoption, as are the kittens. 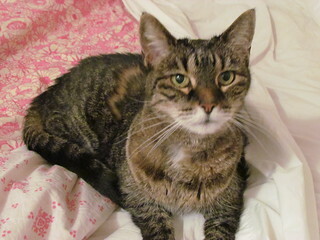 She is a very sweet little girl, so I hope someone will take her soon for her forever home. 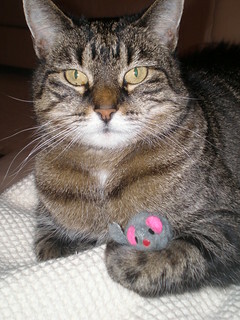 Mumma cats often get overlooked for their kittens, but older cats have a lot of love to give! Not going to lie, I didn't think about getting The Urban Vegan for ages because the cover features the author (Dynise Balcavage) standing in front of a giant pile of red capsicums. Regular readers will understand why this did not appeal to me at all - devil vegetable! Eventually I saw it on sale and picked it up, and it has some really lovely recipes in it. Without capsicums. And yet still, I have hardly made anything from it. In part I think this is due to the layout of the book - chapters such as The Melting Pot, House Party, Haute Cuisine, and Cafe Culture, mean that recipes are arranged very randomly throughout the book. I prefer a book where recipe organisation makes a bit more sense to my brain, so I know where to look when I am after something. Bit I really should make more from it. Here are some of the things I have made. This is the first time this book has appeared on my blog! 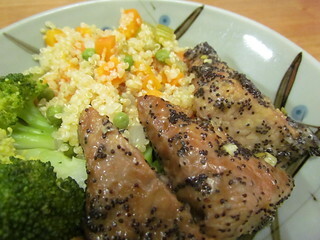 Lemon Poppy Seed Tempeh and Confetti Quinoa: The tempeh has a very strong lemon flavour, calling for the juice and zest of four lemons. I do wish cookbook authors would give a volume amount for this sort of thing, as sizes vary so much so I always feel like a bit of guess work. The other issue was the marinade, it has 2T cornstarch in it, and it goes super gluggy. I served is with the Confetti Quinoa, as suggested. This is a fun little grain dish with onions, celery, corn, and peas. And more lemon juice. I took the option to make it with stock rather than water, which gave a nice flavour. 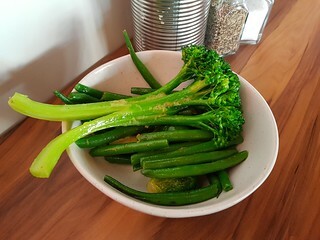 I also served this with some steamed broccoli. Sandwich Mousse: This had a delicious savoury taste. It is based on pink beans (I used borlotti) to give a nice colour, but has a lot of great additions like tahini, sumac, and nutritional yeast. 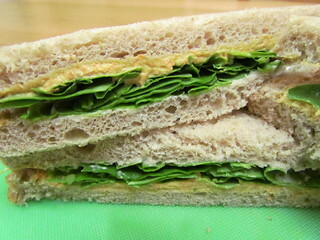 Spread on bread with some baby spinach for a great sandwich. Grilled Cheese and Banana: It sounds weird, but it works great! 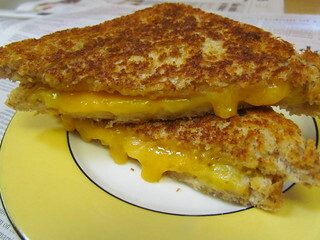 Very simple, sliced banana and cheese in bread, and then toast in either a sandwich press or skillet. I made this quite a while ago, so used some Tofutti American Style cheese slices. 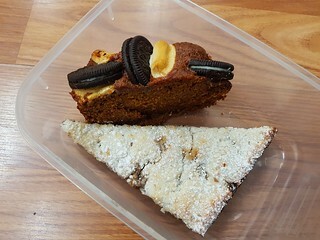 Even today, I still enjoy these slices. I know they taste plastic and processed, but that is the charm. Anyway, good combination! Curry Cashew Casserole: Hello delicious! 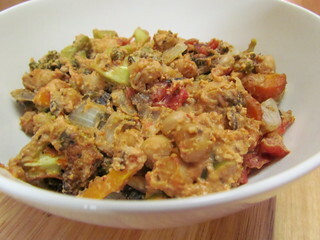 I very much loved this casserole, with broccoli and chickpeas and a creamy cashew based red curry sauce. The recipe calls for cashew butter and a small, Susan-friendly amount of red curry paste. Served four over rice, and definitely recommend. 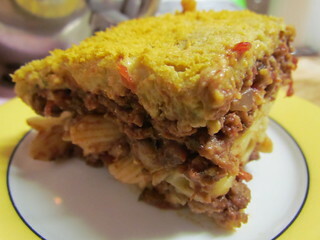 Pastitsio: I don't remember the first pastitsio recipe I made as a vegan, I'd certainly never had it before I went vegan, but I became a big fan almost immediately. Something about the tomato nutmeg meaty sauce, pasta tubes (this recipe calls for ziti, I used penne), and creamy white sauce is just so satisfying. This recipe was to make a large amount, I jiggled with it a bit by using half the pasta, but still making the full quantity of the meaty mixture and the bechamel. This gave me two layers in an 8 inch square casserole, which worked out perfectly. I used Linda McCartney mince for the filling, and used the bechamel recipe in the book. 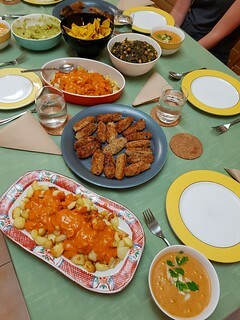 The sauce was roux based, and has a lot of nutritional yeast in it. It ended up more like a cheese sauce than what I would consider a traditional bechamel. 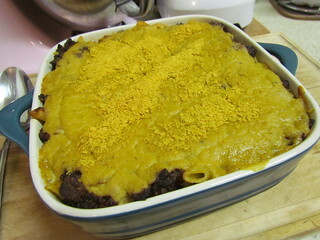 The casserole can be topped with either breadcrumbs or nutritional yeast, I chose the latter. But I think a mix of panko and nutritional yeast would be the ideal crunch topping. Brussels Sprouts au Gratin: Not a gratin at all, more like slightly cheesy Brussels sprouts. 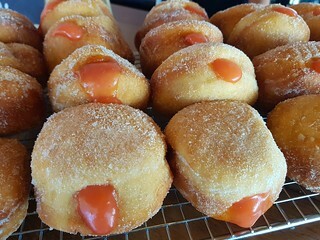 They are steamed until just tender (don't over moosh them! 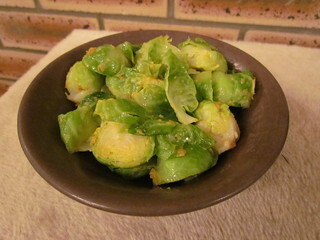 ), then tossed with Nuttelex, nutritional yeast, and seasoning. It is simple, quick, and tasty, whatever it is called. 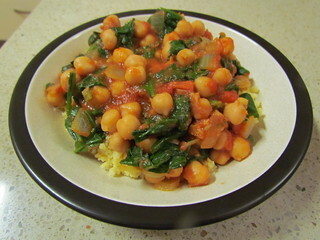 Chickpeas with Tomatoes and Spinach: Simple, fresh, and nice flavours. Unlike the gratin, this is perfectly named. 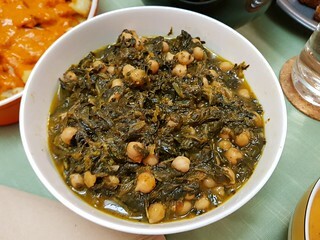 Chickpeas, a mix of fresh and tinned tomatoes, and fresh spinach are sauteed and served over rice. A very fast and easy way to get dinner ont he table. 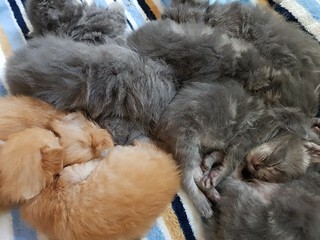 A giant pile of sleepy babies. They have grown a lot since this photo, they are much bigger now! Dim Sim's results came back confirming the UTI, so we've got four weeks of antibiotics ahead of us. She is much better now though, so that is good news! Another lunch visit, they had a fortnightly special that was a burrito filled with mac and cheese, chicken parm, and fries. Of course I had to go there! 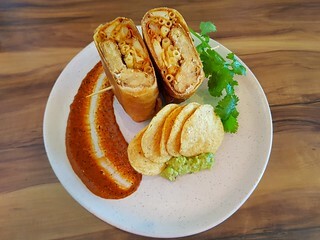 It was so good, they crisped the burrito wrap up perfectly! Alas, that red smear you see there was capsicum based, so I gave it a wide berth. If I'd thought ahead, I would have asked for BBQ sauce instead. This was a pretty fun special! In very important news, Yavanna does milkshakes. And while coconut ice cream is their default, they often have soy ice cream for people like me! I have enjoyed two soy strawberry milkshakes there. 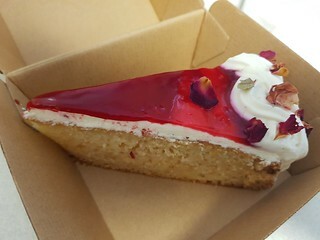 Always strawberry, as that is the best flavour. Once they didn;t have soy ice cream, so they made me a strawberry milk with a reduced cost. 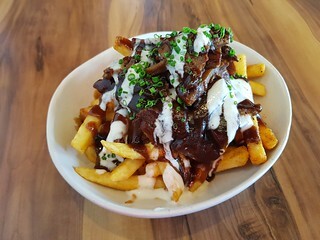 Not long ago, I popped in for lunch to try their special - the Halal Snack Pack. This was chips with gyros 'meat' slices, cheese sauce, sour cream, and sweet chilli sauce. 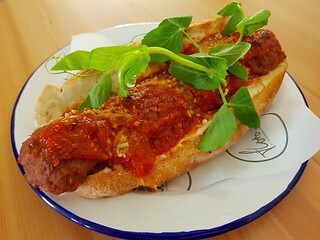 But I had them sub the sweet chilli for BBQ sauce, which was excellent. 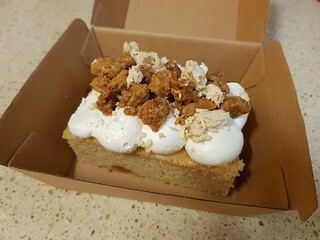 If you are wondering more about their delicious baked goods, stay tuned for the next post! I little break from kittens for my sweet baby girl. 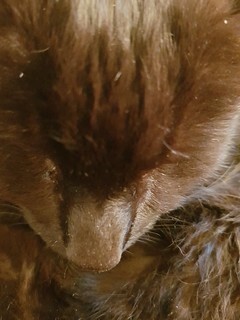 She was a bit off yesterday morning, had some vomiting and not eating. It was stressful being at work away from her, but when I got home it looked like she had a UTI. Waiting for culture results from the lab, but have started her on some antibiotics in the meantime and she seems better. 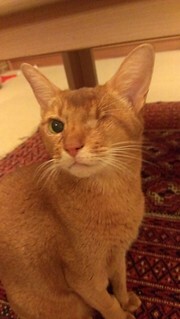 I don't like it when she is not well, we had all good results only two weeks ago with her senior check!